Hair is one of the most important features that add to our personality. But our crowning glory can become bane or unhealthy, if good care is not taken. Our diet, hectic lifestyle, chemical products, and environmental conditions can be blamed. Shedding hair can also be the reason for lower self-confidence, but with the help of the Ayurveda Science, you can restore your hair back to its health and luscious glory. 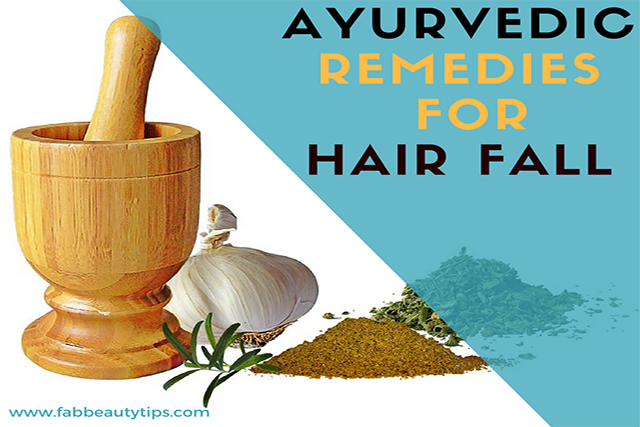 Try some of these amazing Ayurvedic remedies for hair fall and regrowth. Take a bowl and combine all the ingredients in it to make a thick smooth paste. Now section your hair and start applying the paste onto your scalp and hair. Leave it on for 30 minutes before washing it off with water and mild shampoo. Thrice a week till you get the desired results. Amla or Indian Gooseberry is one of the best Ayurvedic remedies for hair fall that also purifies the blood. Amla acts as a natural conditioner. It substantially aids in reducing dandruff and promoting hair growth. Blend leaves with water to form a thick paste. If using the powder form then simply mix it with water to make a paste. Now apply the paste onto your scalp and hair. Leave it for 15-20 minutes and then wash it off with shampoo. Bhringraj is considered as the king of herbs that helps in regrowing of the hair and also reverses balding. This Ayurvedic herb is also prevents premature graying and provides a calming effect. In a bowl, combine all the ingredients and keep it aside to set. Now rinse your hair with water and then pour half of the shikakai-water onto it. Massage for five minutes. Rinse with water and repeat the process. Repeat the process every alternate day. This Ayurvedic ingredient is also known as the fruit of hair. It helps to restore the scalp health, cleanses the hair, reduces dandruff, and treats hair fall. In 2 cups of warm water, soak the reetha overnight. Next morning, boil them in the same water for 15-20 minutes. Now set it aside for cooling down and then strain the solution. Rinse your hair with water. Then pour reetha-water on the hair. Massage them for 5-10 minutes and then rinse with normal water. Repeat the process. You will find that the solution starts forming a little bit of lather. At this stage, rinse with water again. Reetha is an Ayurvedic ingredient used by women for years as a natural shampoo. Reetha is one of the best Ayurveda remedies for hair growth that also improves texture, adds volume, and cleanses them thoroughly. Grate coconut and place it in a pan on simmer for five minutes. Now strain to extract the coconut milk. Then add the remaining ingredients. Mix and apply on your scalp and hair. Leave it for 30 minutes. Rinse with shampoo and water. Coconuts are rich in antifungal and antibacterial properties that prevent scalp issues and free the scalp from harmful radicals that restrict proper hair growth. Take a bowl and combine all the ingredients to make a thick paste. Now apply on your scalp and hair. Leave for 30 minutes and then wash it off with lukewarm water. An excellent Ayurvedic ingredient that keeps the scalp healthy, curbs hair fall, and promotes hair growth. You may also read amazing benefits of Aloe vera for hair. Dry roast the seeds and then grind it to make a fine powder. In a bowl, mix the water and powder to form a thick paste. Apply the paste on your scalp and hair. Another effective ayurvedic remedy that controls hair fall, reduces dandruff, and boosts the scalp health. In a bowl, mix all the ingredients and then apply the mix on your scalp and hair. Leave for 30 minutes and then rinse with normal water. Rich in Vitamin B5 and D, yogurt promotes hair follicle health that helps with the re-growth of the hair and reduces hair fall. Boil the neem leaves in water for 10-15 minutes and then set aside to cool down. Now strain the solution and then wash your hair normally. Now pour the neem-water on your hair as a final rinse. Neem is a great ayurvedic remedies for hair fall and a ingredient that has been helping us for years in treating hair loss issues. Using neem on the scalp regularly improves blood circulation, strengthens the roots, and supports hair regrowth. Neem is also used to treat hair issues such as dandruff, excessive sebum, and psoriasis. Heat the oil (lukewarm) and then section your hair and apply the oil on your scalp and hair. Massage and leave for 30-40 minutes and then wash it off with lukewarm water. Massaging the hair and scalp with an Ayurveda-recommended oil enhances circulation, rejuvenates hair follicles, and increase volume and length. Take a bowl and combine all the ingredients in it to make a thick paste. Now apply it on your scalp and hair. Leave for 30 minutes and then wash with water. Take a bowl and combine all the ingredients to form a smooth mixture. Leave for an hour. Wash the scalp with lukewarm water. The herb is great for strengthening the hair, promotes its re-growth, reduces dandruff, split ends, and itchiness, and is good for overall scalp health. Mix and then section your hair. Apply the oil mixture onto the scalp and hair. Massage and leave for 30 minutes. Now wash with shampoo and lukewarm water. Indian Spikenard or Jatamansi is a great Ayurvedic herb that helps to boost hair growth, improves circulation, and purifies the blood. Take a bowl and mix ingredients. Apply it on your scalp and hair. Leave for an hour and wash with water and mild shampoo. Lemon juice acts as the natural conditioner and a great Ayurveda remedy to treat scalp issues. Lemon is one power-packed remedy that supports hair growth and makes them shiny. Grate onion and squeeze the mixture to get the juice. Apply on your hair and scalp. Leave for 15 minutes and then wash with water and mild shampoo. One of the most effective and oldest Ayurvedic remedies for hair fall. The natural sulfur present in the onion increases the production of collagen in the tissues and helps in the regrowth of hair. You can do same with the potato juice. Try onion juice for hair growth. Thanks for this detailed post! After having a baby, hair fall and hair loss is quite common. I sometimes use Mustard Oil with egg whites to make a hair mask and that is also an effective remedy. I swear by bhringraj. It helps in hair growth. These are some great tips, since it is ayurvedic I surely would love to try it out. I have known about a few of these remedies before but some are very new to me. Really nice tips to control hair fall. Amazing and a detailed post. Have been experiencing hair fall and will try these home remedies. Only thing which one is for dandruff ? I and my mom have been facing a lot of hair fall since May! It is really sad to see so many strands of hair go down the drain! These are some easy natural recipes! Will surely try! Oh my god, so many tips for hair growth. I am using reetha currently on my hair. I am going to bookmark this page for future reference. Great post. I love the simple home remedis you share in your posts. Hairfall is a big problem with me. Will surely try some of these. I have tried quite a few things after baby birth but somehow nothing has worked. Fenugreek gives me a affirmative action to stop hair fall, along with aloe Vera for the nourishment. Every single ingredient you have mentioned here is capable of control lying hair fall. I have used some in the past and have always got nice results. Thanks for this wonderful article. Wow! Such an amazing Post! I have hairfall problem and have been hearing about applying Amla for a while now. Will soon try your recommendations! !